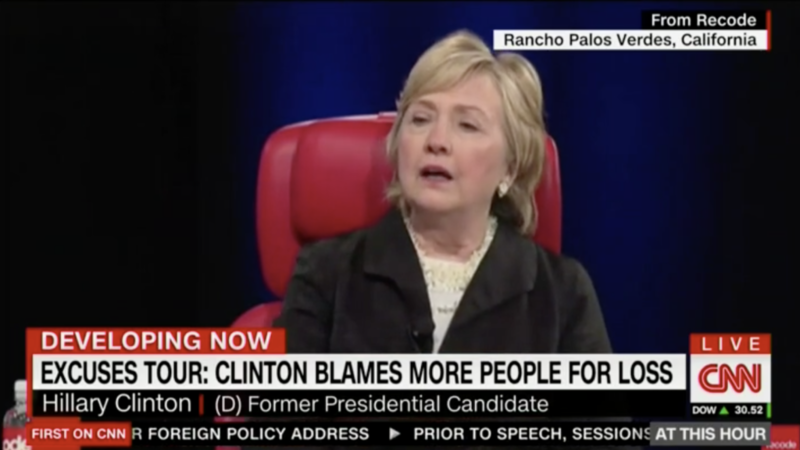 Hillary Clinton’s excuses tour has begun, as she repeats her frequently discredited arguments as to why everyone else is to blame for her losing an election she should have won against Donald Trump. She repeats her claims that Russia and James Comey are responsible. Shattered already revealed how Clinton latched onto blaming them within the first twenty-four hours of her loss to place the blame for her mistakes on others. Plus she repaid Bernie Sanders for selling his soul and spending months campaigning for her by also smearing him. Just like when she was Secretary of State, Clinton is also selling access to her, charging up to $2000 a head.